I've always been drawn to personalized items. I feel something is more exclusive and special if it's personalized and made just for that person. I'm 41 years old and still get giddy when something is made especially for me. One company that specializes in personalized products and gifts is PersonalizedCart.com. The company claims to make each item and engrave by hand. Some of the merchandise they offer is personalized cuff links, leather journals, picture frames, mouse pads, and more. 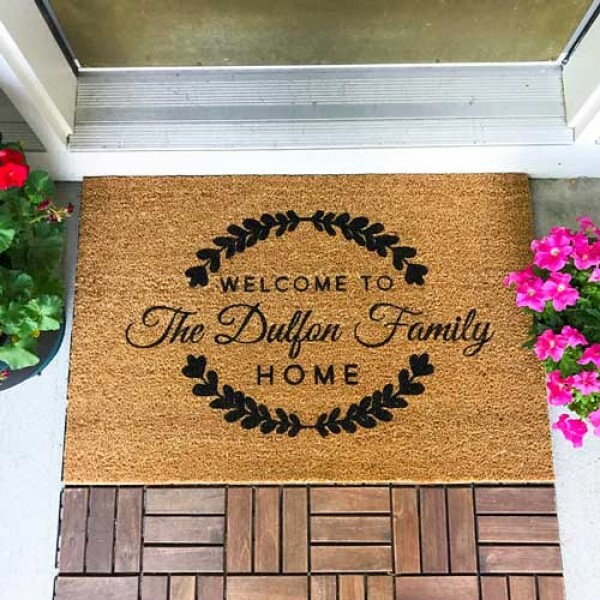 I chose to review a Custom Front Door Mat, personalized with "Welcome to The Heck Family Home". Consumers can choose from two sizes of this door mat and it can be personalized with what you like. The mat itself is made of coir fiber and the personalized portion is from permanent acrylic paint. When I received the door mat, it was wrapped as a cylinder. I was afraid that would cause it to not lay flat when I opened it from the package but, luckily, that was not the case. My door mat lays flat and has not curled up at any time. I did some research on coir fiber and learned that it's made from coco fibre extracted from the outer husks of coconut which makes it a natural and environmentally friendly doormat. Coir mats are relatively waterproof and one of few natural fibres resistant to deterioriation from sea water. My Custom Front Door Mat is set out next to the doorway of my living room. I like the design and style of the personalization. I do wish the personalized part was a little darker, so it'd be more prominent. But, other than that, I like the mat for its looks and functionality. Your mat is so pretty! I need one of these for our front porch. I love this. So pretty. Our front door mat is 10 years old. I think it's about time for a replacement!